Paraovarian cysts are embryonic remnants of the Mullerian and Wolffian ducts, rarely responsible for complications, such as torsion of the cyst and torsion of the ovary or rupture., These complications are often difficult to diagnose. We report the observation of a 12-year-old female child with no particular medical or surgical history who present for acute abdominal pain evolving for 6 h. The clinical examination showed a 37.5°C temperature with sensitive right iliac fossa. The white blood cells count was 9000 cells/mm3, and the C-reactive protein was 24 mg/L. The abdominal ultrasound with computed tomography suggested the diagnosis of right ovarian torsion. Laparoscopic surgical exploration was decided. The approach of the abdominal cavity was made through a single umbilical incision using a glove port [Figure 1]. The laparoscopic instruments were introduced through this single incision. It was torsion of a right paraovarian cyst [Figure 2]. The right ovary and the appendix were safe. The cyst was completely resected. The extraction of the specimen was performed through the same single incision. Histopathologic examination of the cyst confirmed the diagnosis. 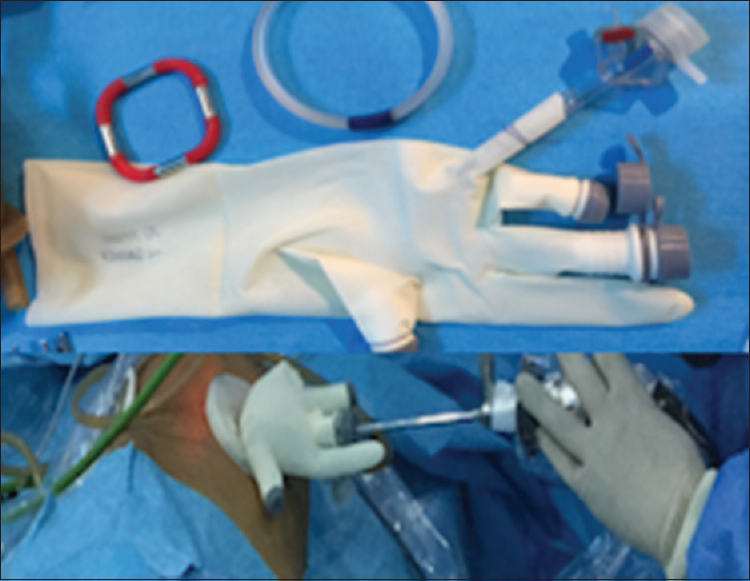 The postoperative course was simple with a follow-up period of 10 months. Paraovarian cyst torsion is a rare complication which occurs in 2%–16% of cases. Ultrasonography or computed tomography may be performed preoperatively, but none of these imaging techniques have specific criteria for diagnosis. Hence, in most cases, misdiagnosis as an ovarian mass remains to be a problem., The diagnosis should be evoked in front of a girl consulting for abdominal pain. Laparoscopy is an important diagnostic and therapeutic tool in case of doubt., Laparoscopy using a single-site incision used in our case was associated with a short hospital stay, less discomfort, and good cosmetic results. Torky HA, El-Sayed AA. Laparoscopic removal of large gangrenous paraovarian cyst in an adolescent girl. J Biomed Sci Appl 2017;1:10. Benkirane S, Alaoui FF, Chaara H, Bougern H, Melhouf MA. Twisted paratubal cyst: Report of a rare case of difficult diagnosis. Pan Afr Med J 2014;19:25. Kiseli M, Caglar GS, Cengiz SD, Karadag D, Yılmaz MB. Clinical diagnosis and complications of paratubal cysts: Review of the literature and report of uncommon presentations. Arch Gynecol Obstet 2012;285:1563-9. Erikci VS, Payza D, Ergin M, Hosgör M. A paratubal cyst associated with flegmonous appendicitis: A case report and review of literature. J Pregnancy Child Health 2016;3:232. Macarthu M, Mahomed AA. 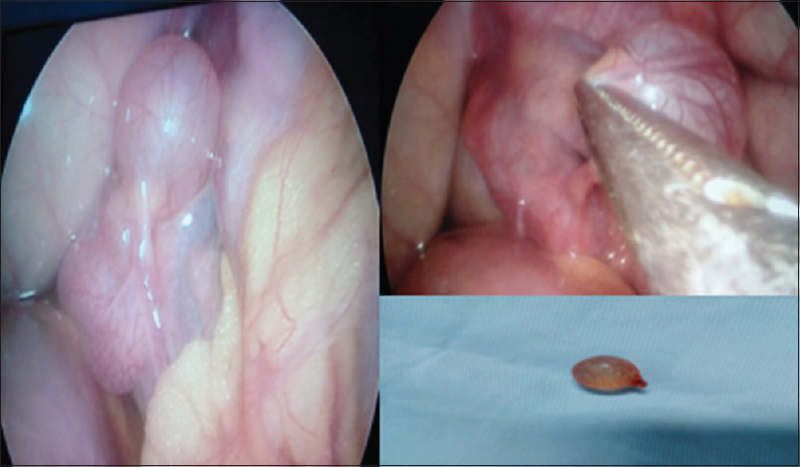 Laparoscopy in the diagnosis and management of a complicated paraovarian cyst. Surg Endosc 2003;17:1676-7.